The three-day tournament was attended by 15 current Eagle Engineering students and four mentors; joined by four former teammates now attending The University of Colorado. 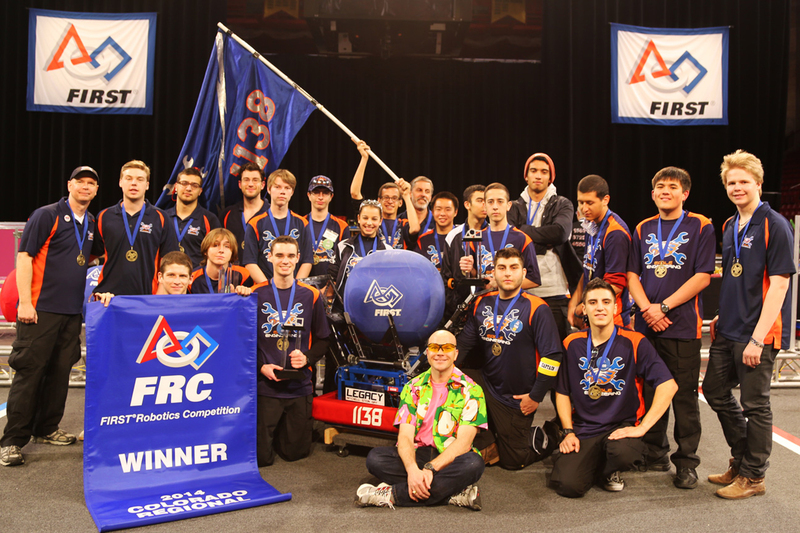 The team, and their 2014 robot named Legacy had to overcome stiff challenges to reach this level of success. Starting in January, all of the 63-member team had to design and build a robot to play a unique new game called Aerial Assist and they had to have it completed in only six weeks. With the official competition robot finished and sealed at the deadline, the team completed a duplicate machine to give them four weeks of preparation and practice before their first tournament in Long Beach, California. At the event in Long Beach, the robot was plagued with technical problems and poor performance. The team was disappointed but not discouraged by their 55th place finish there. They rebounded with new efforts to learn from their mistakes and engineer solutions to the robot’s problems. With the official machine re-sealed and shipped to Denver, the team relied on their duplicate robot, Legacy II to rework the design and practice. Upon arrival at the competition, the pit crew had only one day to access Legacy and apply changes while teammates scouted other teams, prepared strategies and presented to judges roaming the pit area. Matches started on Thursday as judges continued to converse with each team, evaluating their engineering, community service, and team spirit. All of the 52 teams competing in Colorado were randomly grouped into three-team alliances for each of 11 qualifying matches, giving schools a chance to compete with and against each other throughout the day. On the first day, Team 1138 held top spots and ended up finishing with eight wins and zero losses. This was due in large part by clutch play from their senior drive team of Nick Kureghian ’14, Collin Lane ’14, Sasha Kurkuoglu ’14 and Matthew Nagle ’14. As the second day of the competition rolled around, the team began to draw double-team defense and hard hits with little time between matches to make repairs. Off the field, judges made their last rounds and final selection for team awards. For the finals, the top eight teams hand-picked their alliance partners for the best-of-three elimination rounds. The Eagles chose teams from Rockwall, Texas and San Diego, California to finish the job. The trio remained lossless despite the higher level of competition from other carefully assembled alliances. In the end, Team 1138 prevailed by working together and upholding the FIRST Robotics principle of Gracious Professionalism as they brought home more hardware for their growing trophy shelves. Eagle Engineering’s Corporate Sponsors include Aerojet/Rocketdyne, Xerox, Medtronic and Boeing.